Training up to the Senior Canadian Championships, I had a great feeling. My training was on point. I was hitting my openers, and numbers even higher, with ease. I decided to move up a category from 69kg to the 75kg class because I was tired of cutting weight. I couldn’t stand starving myself for another minute; I needed all my strength and power for this particular meet. The big day, Mother Nature had to surprise me with her best gift of all. I was determined not to let this minor setback affect me mentally, because I believe in mind over matter. And you can overcome whatever you`re faced with at a particular moment if you have a strong mind. 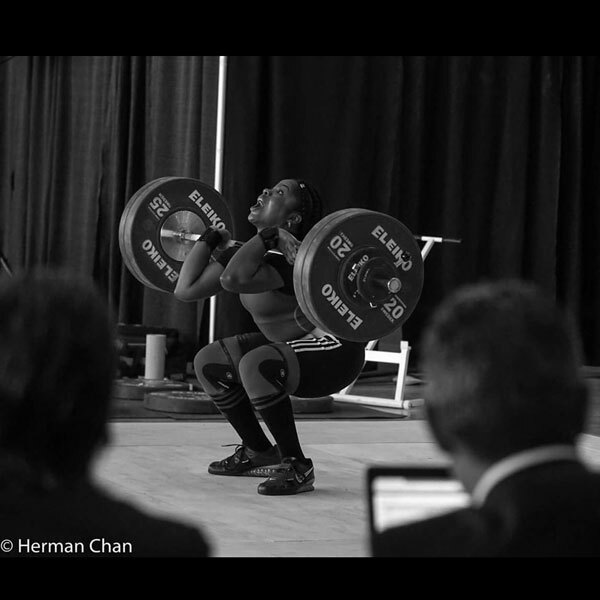 In my opinion, Olympic Weightlifting is 90% mental. During warm-up, the weights felt light. I was moving quick and powerful. I felt confident and strong in my attempts. The snatches were over, but I wasn’t too pleased in my performance, I could have done better but I knew it was due to technical error, not strength. The clean and jerks were next, I knew I had to shake the anger I felt about the last session and prepare mentally for what was next. 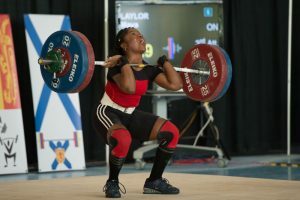 My cleans were slow and not as powerful as my snatches and my coaches (Clance Laylor and Alexander Varbaov) were starting to worry. I was supposed to open at 110kg but they decided to drop down to 105kg opener. I knew the main reason for my sluggishness was due to Mother Nature`s untimely visit. I never let that affect me psychologically though. I was doing well up until my last clean and jerk, my rest time was cut short and I jumped 6kg without rest. My dad moved up 1kg for extra rest, and the weight was now at 117kg. As I was walking towards that weight, I had no fear whatsoever. I was ready. I felt like I had turned into `She Hulk`. I got the clean. I was so ecstatic, but I knew I had to jerk it, so I was calming myself down while that 117kg was on my shoulders. 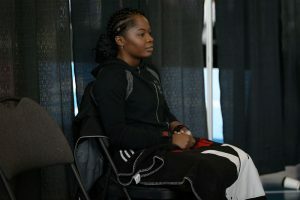 I went for the jerk (put everything I had in it) but as soon as the weight went up and I was getting ready to lock it out I felt excruciating pain and heard the sound of cracking bones in my left elbow. I immediately dropped the weight behind me and dropping to my knees, I bent over grasping my left elbow, weeping inconsolably. Instantly, my dad and several others ran to my side while I knelt down crying. I know in my heart of hearts, without a doubt, that I would have gotten that 117kg clean and jerk if my elbow had not given out! Since the injury, I have seen three doctors. It turns out that I have torn my ulnar collateral ligament which is responsible for keeping my elbow and forearm stable and prevent them from flopping around. Many thoughts are running through my mind. I feel lost and have no idea what to do with myself. When I got home and told my sister Kia the diagnosis, I broke down. I can’t believe what is happening to me, I do not want to accept that I am injured and have to stop Olympic Weightlifting for 3-6 months until I am healed completely. I feel useless. But I will get past this, mind over matter. 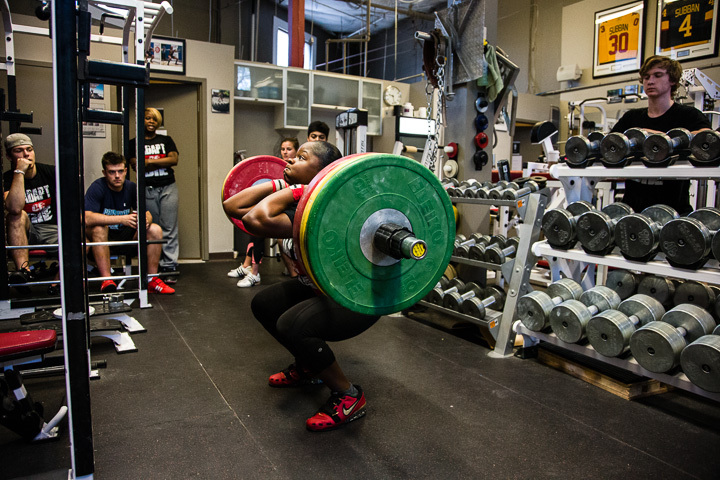 Being an Olympic Weightlifter is not easy; trying to be successful at anything is never easy. I have never liked training. I have never liked the burning sensation of reps, having to push my body to its breaking point everyday, and going home exhausted, not having enough energy to even take a shower. I have never liked the soreness in my body the next morning following a particularly difficult training. I have never liked the hard work I have to put in to get the results I want. But, in my mind, I have no choice. I do this because I want to, because I love, crave and am addicted to success. It is a constant grind; having to wake up when every single muscle, ligament and bone in my body is telling me not to; taking the TTC transit to training, all the while motivating myself for another training session. 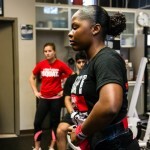 The toughest part of being an Olympic Weightlifter is getting through a sticking point. A sticking point is when an athlete is at a standstill in weights, where there are no personal best being made, pretty much stagnant. It is essentially a mental block, and I have to constantly remind myself that “I am a champion and this is what champions endure, this is just mental” and to “keep pushing through”. My dad/coach always tells me to “just work!” when I’m having a particularly tough session. Ultimately, the struggle is well worth it. It is worth it every time I step out onto the podium to collect a medal, and it will be even more worth it when I step out onto the ultimate podium, the Olympic podium to collect the ultimate medal! Usually I have to lose weight for my weigh-ins, but this time I actually had to gain weight for this year’s Junior Canadian Championships in Winnipeg for the 75kg weight class. As a strategic move, our team’s head coach decided to place me in that category the night before the competition (I’m usually a 69kg competitor and 75kg is the next class up). At that time, my weight was 69.5kg and the next morning, day of the competition, I was only 68.4kg. At this weight I would not have been able to lift because I was UNDERWEIGHT!! Now that was a first!! If I wasn’t so worried about missing the competition, it might have been comical! But, it wasn’t. I had never faced this dilemma before. 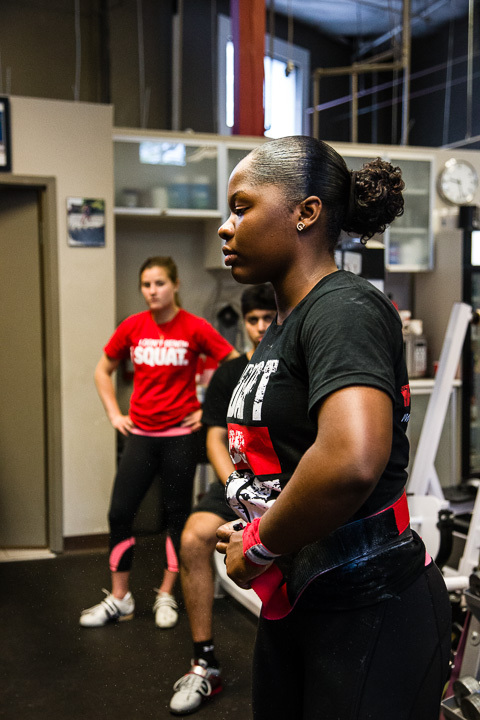 After your weigh-in time, you have an hour to lose or gain weight in order to lift in your chosen weight class. So here I was running back and forth from wolfing down breakfast at the restaurant to the weigh-in room. I was stuffing my face with lots food and even more liquid. Luckily, the competition venue was in the hotel along with the restaurant. There was 20 minutes remaining for the weigh-in and within that time I had weighed myself twice. Finally, by the third weigh session, I had made weight! Halleluiah!!! After struggling and at times panicking about losing weight for my 69kg weigh-ins, never in my wildest dreams did I ever imagine that I would experience the stress of having to GAIN weight! Let me just tell you that neither is an easy experience to face. That was definitely one of the most interesting mornings I’ve ever had before my competitions. 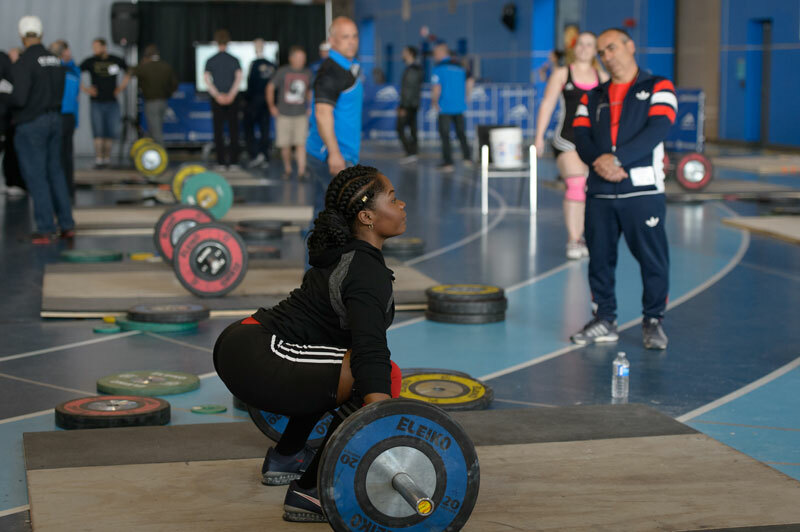 As a female lifter I have to take many things into consideration for competitions, like having your “monthly cycle” on the day of an important competition! Today I had the Ontario Junior Championships and it didn’t go as well as I would have liked. For the last few weeks I was having great training sessions and thought I had this competition in the bag. Days leading up to the competition mother nature decided it was the perfect time to bless me with her gift. I have noticed around this time I get weaker, my strength dips and my performance decreases. Today I learned you have to roll with the punches, no matter what life throws at you. 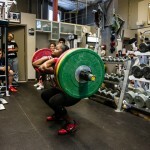 Front squatting 115kg/254lbs Maya demonstration the importance of leg strength for sport at the annual 2013 Offseason Kick Off for Laylor Performance Systems. 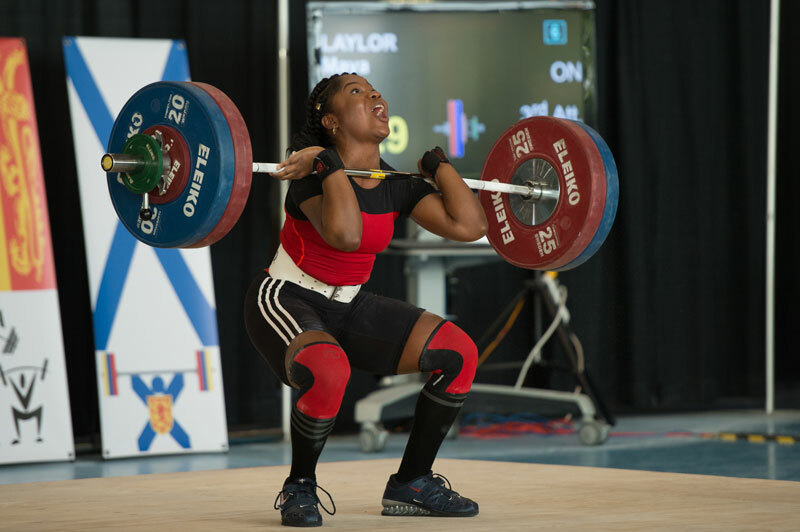 17 year old Maya Laylor, the current weightlifting champion of Ontario, continues training and pushing herself past her limits as she prepares to compete for Canada in the upcoming PanAm games in Toronto, and in the 2016 Olympics. © 2017 Maya Laylor. WordPress Help & Supported by WPUP Inc.